Today, many tend to think of “girl power” as a millennial phenomenon, when young women serve as bright, new examples of progress to mothers and grandmothers. The truth is that females have been blazing away at that trail for decades, sparking the change the latest generation now strives to grow. Just look at Junior League of New Orleans Sustainer of the Year Katherine “Katie” Andry Crosby, a modern New Orleans woman who defines the idea of having it all, from stay-at-home mom to Chairman of Fidelity Bank. In the late 1970’s and early 1980’s, Katie earned her degree in Business Administration from Vanderbilt University (1983), married E. Howell Crosby (July 1984), began a family and followed in her mother’s footsteps when she joined the Junior League of New Orleans. Katie relished being at home to raise her growing family of three children and working on a variety of JLNO committees: Cookbook, Lagniappe, Community Assistance Fund, Holiday Marketplace and Placement. 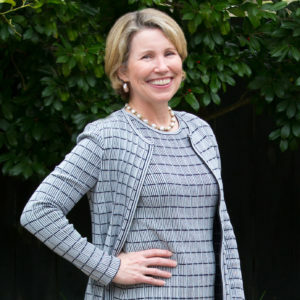 The native New Orleanian began tackling JLNO leadership roles in 1995, when she assumed the office of JLNO Treasurer, followed by Nominating Chair in 1997, President in 2000, Endowment Campaign Steering Committee from 2001-2003, Nominating Committee Advisor in 2002, and finally Sustaining Advisor to the Board in both 2004 and 2013. Indeed it does, and it’s a trait that has served Katie well. The Country Day alumna has held multiple leadership positions besides her JLNO service, including serving as a Board Member for the New Orleans Branch of the Atlanta Federal Reserve Bank, on the Selley Foundation’s Board of Trustees and as a WYES-TV Board Member. She credits the lessons she learned from her JLNO service with helping her to tackle these and other challenges in life. Katie’s largest leadership challenge came in 2003, when she became the first female director in the history of New Orleans-based Fidelity Bank. Besides the pressure of being the first woman to hold this position, Katie also had family expectations to meet. She’s the great-granddaughter of Allain C. Andry, Sr., one of Fidelity Bank’s original founders. If the load of family, career and volunteer service weren’t enough, Katie added another role shortly after becoming a director for Fidelity Bank. In 2006, this mom of three and volunteer extraordinaire concluded she could grow more personally and professionally. She decided to return to college, a daunting goal she knew she could achieve after reflecting on her JLNO experience. Although her life was brimming, Katie decided to pursue her graduate degree when her youngest son was a freshman in high school and her two oldest children were in college. The driven mom wanted to ramp up her professional life as her children were leaving or preparing to leave home. Her role as a director with Fidelity Bank required some time commitment, but she knew since her children were growing, she had more to offer. Katie was accepted into Tulane’s A. B. Freeman School of Business. Tulane’s Executive MBA program runs for 18 months with classes every other Friday and Saturday. It’s designed for employed students that have attained a certain leadership level within their professions. Katie did not fit that exact description, but her admirable service to JLNO helped pave the way for her acceptance into the program, despite her nontraditional resume. “While I was not employed full-time, my role as a director at Fidelity Bank, and also my volunteer experience, including JLNO President, provided a unique perspective,” Katie says. She received her MBA in 2007 and also became a member of the exclusive business honor society Beta Gamma Sigma. Katie then channeled her energy and education into Fidelity Bank and became Chairman of the Board in 2010, a position she still holds today. Her closest friends and fellow JLNO sustainers are not surprised by her success. Melanee Usdin has known Katie since grammar school and was President of JLNO in 1999, the year Katie was President-Elect. Katie’s interest in others has kept her actively involved in the League well into her sustainer years. She and her husband now have four grandchildren, but she still finds time to volunteer with many organizations across the city, including JLNO. Katie is a shining example of how impactful sustainers are to the mission of JLNO and the city of New Orleans. Her service, not just as an Active but also as a Sustainer, was a significant part of Wendy Beron’s decision to co-nominate Katie for the honor of JLNO Sustainer of the Year. Wendy is also a JLNO Sustainer and Past President, who now serves as President and CEO of Methodist Health System Foundation. “Go for It” is a mantra Katie has clearly taken to heart and one that we can all use to inspire and empower our own lives. Article written by Jen Hale with photography by Jessica Bachmann.